Spectacular Moonswept Villa is now taking reservations! Moonswept was named one of the Top 5 New Caribbean Villas of 2008 by Caribbean Way Canada Magazine. The villa is owned by two New York City musicians, Garry Dial and Terre Roche. We are very fortunate to report Moonswept sustained minimal damage during Hurricanes Irma and Maria and we're taking reservations for all dates after April 1,2018. No power outages due to the addition of Tesla batteries and solar panels! You can visit our website for more information. Moonswept is a picturesque retreat, high above the turquoise waters of the Caribbean with its scattering of islands, splendid in the morning sun and magical in the moonlight. The villa is a spacious getaway as far from the madding crowd as one could be, with the luxury of a villa and the serenity and natural beauty of an enchanted island. When you enter the front door the high vaulted ceiling is a grand dome over the kitchen area, not unlike the sky itself. You're inside, but you're not cramped. Almost immediately you are called toward the Great Room by the most spectacular view of the sea through huge windows that give a sweeping vista of your surroundings. You'll want to stop and experience this moment fully. Many of our guests have remarked that the photographs on the website don't begin to evoke the feeling that comes with being at Moonswept. The villa has plenty of cozy spaces in which to congregate, yet you'll never feel confined. The colors, the artwork on the walls, the furniture and all of the small details of design are elements mindfully added over time to maintain an environment in which each visitor can feel at home. The kitchen is fully equipped with all of the modern conveniences. There are two equal-sized bedrooms, each with a large screen TV, two spacious bathrooms, laundry facilities, a large screen TV in the Great Room sitting area, a wine cooler and Wi-Fi throughout the house. If you feel like eating indoors, you can sit at the great Basque-style dining table in the center of the villa and watch the moods of the sea and sky changing moment to moment. Out on the pool deck you'll sit under the awning in the shade and enjoy meals at the dining table, or soak up the sun's rays on the deck chairs by the pool in a completely private environment. There's a hot tub for soothing the tired muscles that we all seem to bring along with us. This is a great place from which to watch the night sky with it's stars, moon, satellites and comets inviting your mind to expand outward and reconnect with your true nature. We are two New York City musicians. When we arrive at Moonswept we exhale. It is the most exhilerating exhale we've ever experienced! We never dreamed of buying a house in St. John. Through a series of magical events, we visited the island, performed some shows there, bought the land and a dear friend of ours helped build the villa. Unlike any other place we've ever been, Moonswept has a powerful effect on the soul, healing the wounds of stress and empowering us to return to our work lives in New York City. The view from Calabash Boom where Moonswept is situated was voted the top view in the entire Caribbean by Caribbean Way Magazine. We just returned from a wonderful stay at Moonswept!! The views and trade winds are simply amazing!! Already booked our next stay !! 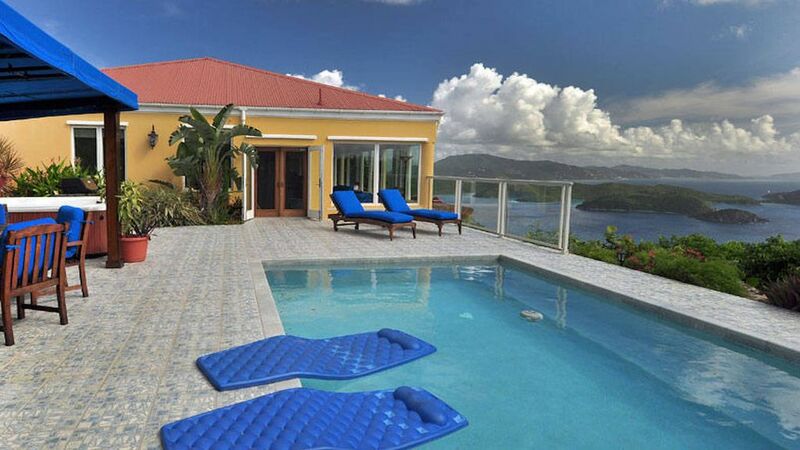 The best Villa in St John wonderful stay Kelly was great. Gorgeous view east of the British Virgin Islands, sunrises and just the expanse of the lovely Caribbean Sea. Spacious, quiet and well worth the 800 foot trek up the mountain in four-wheel drive low. We also hiked it on foot for our daily exercise. We're repeat visitors. Love Moonswept! Thank you for your thoughtfulness in leaving a review of this year's visit to Moonswept. We're so impressed you walked the hill every day! We hope you returned home with a lingering sense of well-being and left all your stress behind with the turtles in the bays! Wonderful for the 3rd time! Moonswept Villa continues to be a wonderful place to stay, with incredible views toward the BVIs. Our 3rd stay at this property, ideal for 2 couples, equivalent master ensuite bedrooms, fully equipped kitchen, pool, hot tub and seating inside & out for dining and relaxing. Very private, high above Calabash Boom, just beyond Coral Bay. Following the devastating hurricanes a year and half ago, the island of St John is making a huge comeback. The beaches are as beautiful as ever. The locals everywhere are very appreciative and grateful to have tourists returning. Thank you Scott for your review. It was especially nice to have you back again for your 3rd visit. We look forward to your next one! We had a wonderful stay at Moonswept. The views are spectacular, and the villa is beautiful, comfortable, and well equipped. We especially enjoyed the deck, with its hot tub, grill, and pergola -- a perfect place to relax. Excellent communication from the owners and the property manager regarding booking and arrival. We hope to return! Thank you for taking the time to let us know about your visit to Moonswept. We wish you all the best in the new year and look forward to your return to visit us on beautiful St. John. This was our 8th stay at this gorgeous house and it was one of our best. We are so relieved that our beloved Moonswept survived the hurricane! The island has recovered so quickly and its gracious and loving spirit is on full display! The owners, Terre and Garry are so wonderful and we are blessed to feel apart of their Moonswept family! The house is perfectly designed and elegantly cozy. Our favorite place to hang out is the pool area under the cabana looking out over the BVIs. I always pinch myself to see if I’m really there or simply dreaming about my favorite spot in the universe. Words are inadequate to convey how lovely it is! St. John is a quiet and pristine haven mainly consisting of a State Park. It is known for having the most beautiful beaches in the world. Hiking, snorkeling, diving, swimming and boating are among the many activities for vacationers. It's restaurants are great, as it attracts many top chefs. There are a myriad of opportunities to dine outside on the beach, high above overlooking the state park and the ocean. You'll have to stop your car to wait as donkeys, goats, sheep, horses, cows and chickens cross the road. There are small boutique shopping areas where you will be able to find treasures to bring home. Opportunities abound for having massages, catered meals and sunset sails among the islands. Our caretaker, Dave, is a long-time island native and a really great guy! He can direct you toward many hidden treasures among the day trip offerings. In the house there are books about the history of the island that you can read as you take in the breathtaking view of the sea. Please visit www.moonsweptstjohn.com for the most comprehensive and up to date information about Moonswept. You are in for a real treat should you decide to pay us a visit! We look forward to hosting you on your vacation.